Antoni Placid Gaudí i Cornet, (25, June 1852 — Barcelona, 10, June 1926) was a Spanish architect born in Reus, in the Catalonia region of Spain and figurehead of Catalan Modernism. Gaudí’s works reflect his highly individual and distinctive style and are largely concentrated in the Catalan capital of Barcelona, notably his magnum opus, the Sagrada Família. Today we celebrate his 161st birthday. Fortunately I have had the happiness of seeing the magnificent work closely, as I have already described in one of my articles in the column “A tour into …” “Barceloneta”. Architect whose distinctive style is characterized by freedom of form, color and voluptuous textures and organic unity, Gaudí worked almost always in Barcelona or the surrounding areas. Much of his career was occupied with the construction of La Sagrada Familia, which was not yet finished when he died. 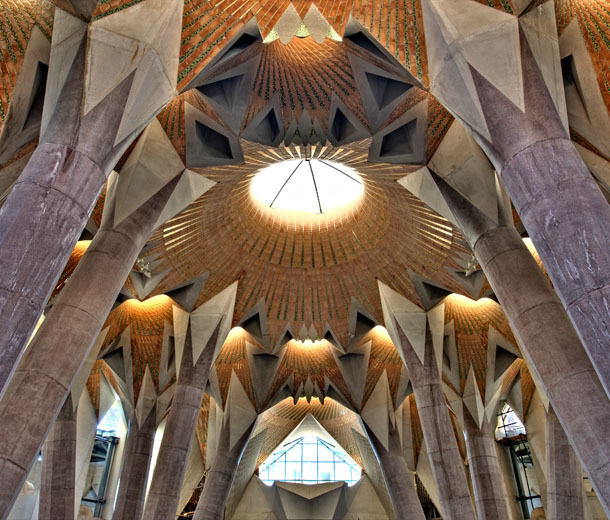 The style of Gaudí has gone through several phases. When he left school provincial architecture of Barcelona, ​​in 1878, started the project in accordance with a very flowery Victorian style, which was evident in their school projects, but quickly developed a way to compose through juxtapositions of geometric masses until there never used, whose surfaces were animated with patterned brick or stone, ceramic panels of bright colors, and metal structures using floral motifs or reptiles. The overall effect, though the details are not, is Moorish – or Mudéjar, as the special blend of Muslim art with Christian is known in Spain. Examples of his Mudéjar style are the Casa Vicens, from 1878-80, and El Capricho built between 1883 and 1885, as well as property and the Güell Palace, the late 80s of the XIX century. All works, except El Capricho is located in Barcelona. Later, Gaudí experienced the dynamic possibilities of various architectural styles: Gothic in the Episcopal Palace of Astorga, work performed between 1887 and 1893 and the Casa de los Botines in Leo, built between 1892 and 1894, the Baroque in the Casa Calvet in Barcelona (1898-1904). But after 1902 their projects can no longer be attributed to a conventional architectural style. Architect admired, although considered somewhat eccentric, Gaudí was an important participant in “Renaixensa” Catalan, an artistic movement revivalist of arts and crafts that are combined with a political movement features nationalists. Both movements sought to reestablish a kind of life in Catalonia that had been suppressed by the centralist government of Madrid, during the eighteenth and nineteenth century. The religious symbol of “Renaixensa” in Barcelona was the church of the Sagrada Familia, a project that occupied Gaudí throughout their career. Hired to build the church since 1883, did not live to see finished. When working on it became increasingly religious, and after 1910 he worked almost exclusively in the construction of the Church, and even last to live in the shipyards. Aged 75, was hit by a trolley-car, having died because of injuries. Ignored during the 20s and 30s of the twentieth century, when the International Style was the dominant architectural style, was rediscovered in the ’60s, being revered by both professionals and the general public due to their overflowing imagination. The evaluation of architectural work of Gaudi is remarkable for its range of shapes, textures, and polychrome, and by the way free and expressive as these elements are combined in his art. The complex geometry of a Gaudí building coincides with its architectural structure in the whole, including its facade gives the appearance of being a natural object conforming fully with the laws of nature. Such a sense of total unity also informed the life of Gaudí, since their personal and professional lives were indistinguishable. Putting aside the historical part. I can say personally that the work of Gaudí, is something that only needs a first look to make us happy. Especially Parc Guell, their colors, shapes … makes us dream, smile and leave us speechless. The man was a genius of his time, an artist that I already knew and admired, but after seeing up close … the fascination increases. The Sagrada Familia, honestly did not impress me much, perhaps even disappointed me. But inside … Oh God … is the tears coming to our eyes. 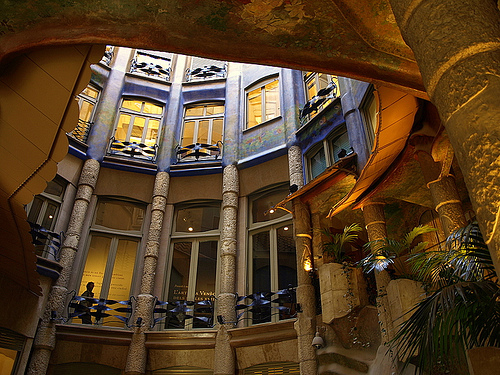 The interior of La Pedrera is a true world of fantasy. Once you can visit Barcelona, visit the world of Gaudí. Worth it.